Why You Need To Be Watching "Fooly Cooly"
An anime review of "FLCL"
"Fooly Cooly", "FLCL," for short, is a six episode OVA (original video animation) loosely based on a manga of the same title. Directed by Kazuya Tsurumaki (protégé to Hideaki Anno, director of widely popular "Neon Genesis Evangelion") and animated by the skilled individuals at Gainax, "FLCL" serves up a lot of beauty and complexity to the viewer. The show details the life of Naota Nandaba, a 12-year-old boy living in a fictional Japanese Suburb called “Mabase.” Without giving too much away about the very short story, the show revolves around the Naota’s relationship with an otherworldly human-looking woman by the name of Haruko Haruhara. After appearing in Mabase in a rather comedic way, Haruko becomes a catalyst of change in young Naota’s life. Coming in both physical and internal forms, this change ultimately guides our protagonist to maturity and agency. Without a doubt, this show is an anime about “growing up” and (at least on the surface) offers nothing new to the existing dialogue. 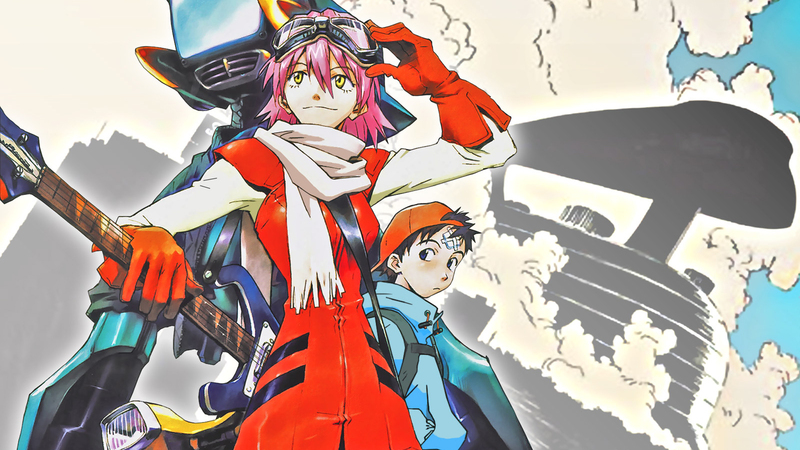 Even to a western audience, the “coming of age” themes of "FLCL" might seem a bit stale. Regardless of whether or not the idea is novel, "FLCL" offers up its message in a beautiful and complex way. Important developments during adolescence like sexuality, identity, partnership, and love are portrayed in FLCL’s well written dialogue, masterful animation and interesting metaphors. For many, however, the semantics of the story and the stale message are too big a pill to swallow. Beyond the, arguably, cliché moral, the sexual-metaphors and the pseudo-pedophilic surface of the story, I think "FLCL" is the best anime I’ve ever seen. "FLCL" is beautiful, especially for the time it was created. During the late 90s and early 2000s anime was riddled with low-budget CGI in an effort to circumvent the cost of paying animators to draw. This lead to a number of anime and even western animations to become notorious for breaking viewer immersion by combining inconsistent/poorly done CGI with drawn image. For whatever reason, "FLCL" didn’t succumb to the tropes of its time and the visuals are worthy of award. Fight scenes are drawn to perfection, emotions are clearly portrayed through facial drawings, and the animation style is never dull. This, in part, is due to the inconsistency of visual style used throughout the show. At several occasions during the short run time, the show will completely flip the animation style without warning or acknowledgement. At one point, the show transforms into a page-by-page manga. At another, it pays homage to the animation style of "South Park." Even if you don’t enjoy the shows story, I think you might still enjoy the awe-inspiring art present in "FLCL." "FLCL" is short. At only 24 minutes an episode (30 minutes for the final episode) and a total of six episodes, "FLCL" is a quick fix. Along with this shortness comes a lack of time demand for those viewers who want to watch something, but might not want to commit to a full 24-68 episode anime series. "FLCL" is smart. Thanks to the directing of Tsurumaki, a protégé to the original 2deep4me director, "FLCL" is a complex show. This is not to say that you need to think hard and deep about the story and all of its elements to understand/enjoy the show (there is some surface value to the show), but viewers that want to be able to interpret and contemplate their show will be happily surprised. The show is ripe with metaphors, it is up to the viewer whether or not they are picked and enjoyed. "FLCL" sounds awesome. The show's OST was produced in its entirety by a Japanese rock group called "The Pillows." In total, the band recorded three entire original albums for the show's six episodes. If that sounds like a lot to you, then you are right. Rarely, if ever, do I recall hearing a repeated song (other than the outro and intro) in "FLCL's" run time. This, effectively, creates a novel listening experience throughout the show. Even when I go back to re-watch the show, Ill find a new song I hadn't noticed before playing softly in the background. Admittedly, my review of "FLCL" is a biased one. Having first seen it during an emotional crossroad of my adolescence, I created a strong bond with the “coming of age” story and its characters. Consistently, I have come back to watch the show when I’m feeling stagnated or unhappy and, consistently, it has brought me joy. This is not to say that the show does not hold its own from an unbiased perspective, and had garnered enough popularity in the U.S. to gain (and continue) air time on Cartoon Network’s “Adult Swim.” Somewhat reputable review-site Rotten Tomatoes has even given it a 96 percent, but for the most part it received above average reviews. Personally, I think "FLCL" is the best anime I will ever see because it so succinctly captured so much within a small six episode package. If you watch anime and even if you don’t, you should watch "Fooly Cooly."